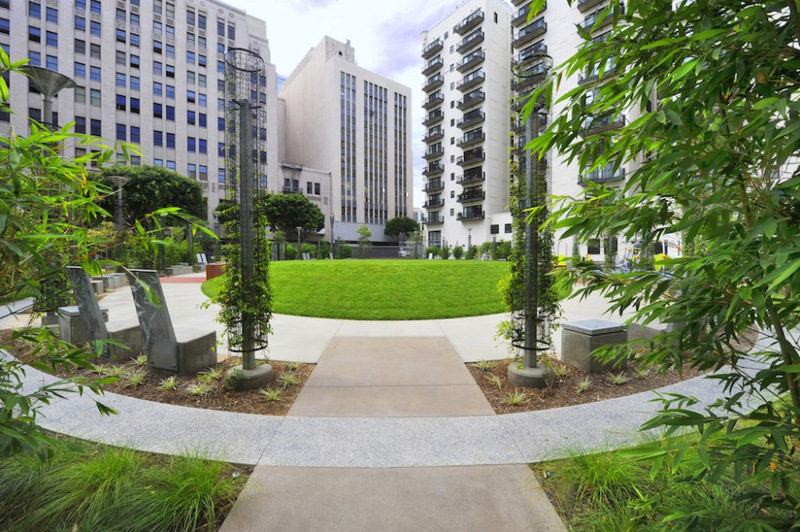 Los Angeles’ 50 Parks Initiative was launched in August of 2012 by then-Mayor Antonio Villaraigosa and aims to transform underutilized properties in areas lacking recreational space into parks. The 16th park to open as part of this scheme is located on Spring Street in the city’s downtown and saw its official opening on June 17th. 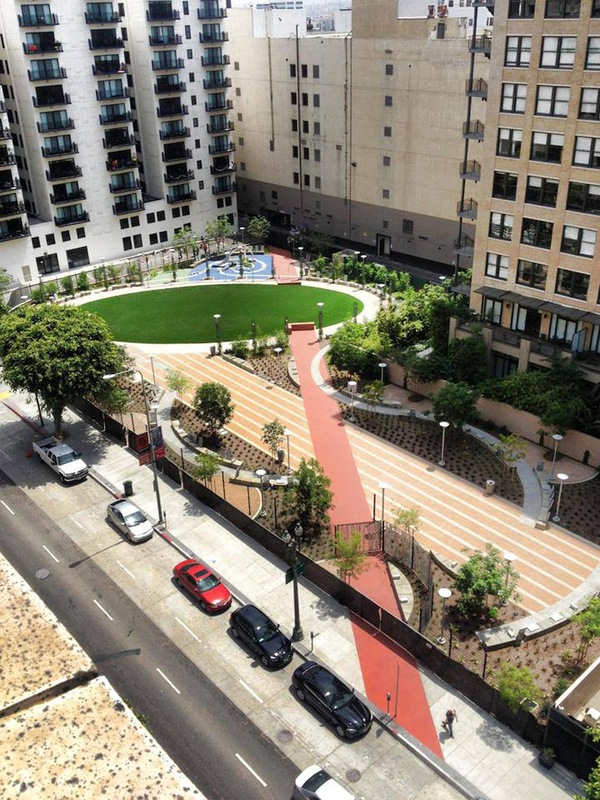 Lehrer Architects partnered on the project with the City of Los Angeles, and we recently got the opportunity to email a few questions to Michael Lehrer about his work on Spring Street Park. 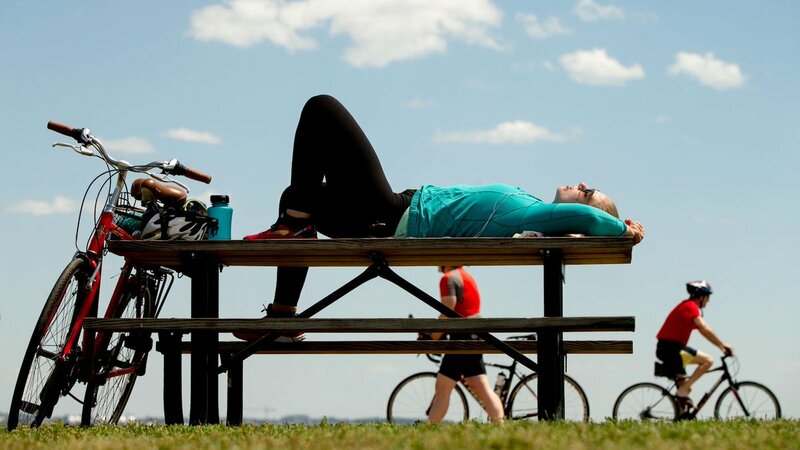 This Big City: You won’t need to convince readers of This Big City that converting a parking lot into a park is a good thing, but not everyone feels this way. Did you meet much resistance when developing Spring Street Park? Michael Lehrer: No resistance at all. It is a motherhood and apple pie opportunity. That said, I have learned that in the public realm even motherhood and apple pie can bring out the skeptics. The friction– actually necessary and desirable friction between public and private interests– in creating public places originates from the different constituencies and their needs which are often at odds with one another. A beneficial tension is created. The fix offered by good design is making important and maybe even beautiful places from that tension. Adults with children versus hipsters who wonder why a tot lot is even necessary; dog lovers versus the non-pet owner; public agencies and their role and cost of maintenance over time versus Homeowners groups committed to the park and their capacity to maintain the park, etc. What kind of involvement did those who live or work nearby have in the park’s design? Significant. The stakeholders were extraordinarily supportive of our design throughout its evolution. Emblematic of where downtown Los Angeles is today, the newly renascent residential communities and the organizations and leaders aggressively stewarded, lobbied, supported, cajoled the City to make it happen and to critique/inform the design. This process began before we were engaged. Public meetings, the ambitious neighborhood association, adjacent developers. Participation was both public and behind the scenes. As a public project, the interests and aspirations of the political leadership – Mayor Antonio Villaraigosa and the City Council members – and Agency leadership are generally paramount. Adjacent owners also had significant input. In our work, we’ve noticed that this process is similar in most urban centers in the developed, democratic world where a range of voices are invited to express their opinion. You talk about ‘thrivability’ and ‘in-the-future vibran[cy].’ What are your ambitions for the ongoing impact of Spring Street Park? 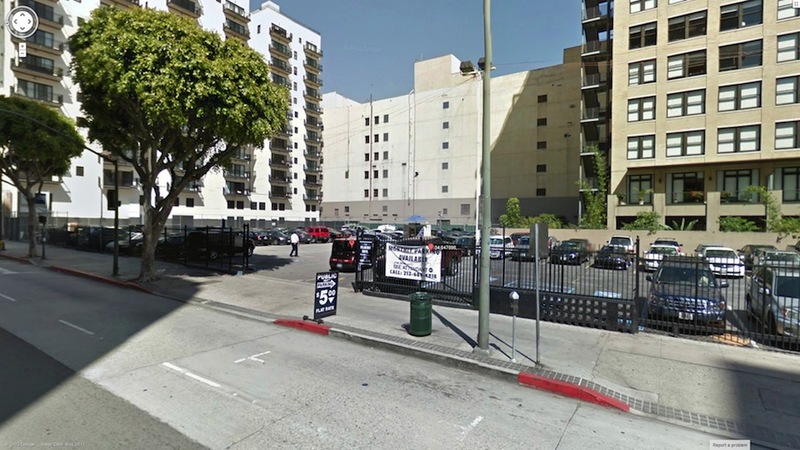 That it become part of the physiognomy of downtown Los Angeles, and particularly the surrounding community. The only real challenge will be to manage dogs and their waste. Otherwise, it instantly is what it will become more of, the community’s outdoor living room. Singles, couples, families, groups, event crowds will all feel it is their place. As the plantings grow, the Park will become more romantic, increasingly the necessary yin to the yang of the Street. How have residents surrounding the development reacted to the new park? Stunningly. Exhilarated. What is so satisfying is the immediacy of the embrace. Like the latest mobile technology, people are already beginning to feel like the Park was always there. Inevitable. 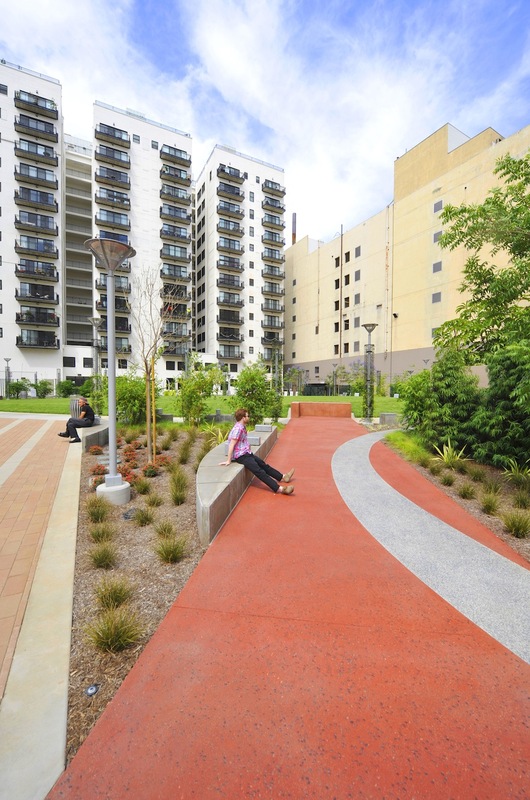 It hits the chord of delight, community, and the sense of urban nurture that parks, almost uniquely give to cities around the world. Public/Private partnerships can be controversial. Can you tell us a little more about the working dynamic on this project? Like any partnership, it takes work, empathy, trust, and role clarity. The City of Los Angeles’ Bureau of Engineering was both our client and our design partner. Their in-house landscape architects brought their expertise, particularly regarding durability, maintenance, and strong sense of appropriate—environmentally and politically—planting. We brought design leadership, agility, and boldness, influencing the team, the City, and neighborhood as much as was best for the project. An anecdote: At some point, we had some large palm trees in the Park. The City Engineer said that wouldn’t work because the Mayor dislikes palm trees. When I saw the Mayor at an event and asked him if the City Engineer was accurate in his assessment, he said, “Absolutely!” I love palm trees but there were to be none in this park and that was okay. We embrace the culture clash, which is significant; but it can easily be deadly. Respecting the imperatives (and tolerating, sometimes painfully) of the public hierarchy is almost as necessary as fiercely challenging them. Quite a dance. $1.45 million US is a relatively modest budget. If you’d had a bigger budget, what would you have liked to include in the park? Actually, it is an extremely modest budget. Ultimately budget is NOT separable from product. Initial choices are driven by possibility. The most important thing, always, is that a project not be second-rate. That it not exude wanting to be something it couldn’t ever be. The goal is for every project to be the best it can be, and to feel that it is the best. It is the essence of design excellence. It is the moral imperative of design. The best that it can be, the least resource to achieve excellent outcomes. A larger budget could have allowed for a more robust—and even some beta testing—sustainability program. State-of –the-art water cleansing, detention, and retention, capturing street water and cleaning it through the park, cisterns, etc…these are desirable, some of them still exotic. It really took all of the financial and political capital available to build the wonderful Spring Street Park.